glomerulonephritis characterized by diffuse thickening of glomerular capillary basement membranes, due in part to subepithelial deposits of immunoglobulins separated by spikes of basement membrane material, and clinically by an insidious onset of the nephrotic syndrome and failure of disappearance of proteinuria; the disease is most commonly idiopathic but may be secondary to malignant tumors, drugs, infections, or systemic lupus erythematosus. Nephrology A common idiopathic nephropathy usually affecting those > age 40, caused by immune complex deposition in the capillary wall of the glomerular basement membrane; it is the most common cause of nephrotic syndrome Clinical Asymptomatic proteinuria or nephrotic syndrome; possibly, edema, weight gain, hypertension, nocturia, anorexia, GFR is near normal Urinalysis Oval fat bodies, hyaline, granular, fatty casts Risk factors HBV, malaria, malignant solid tumors, NHL, SLE, syphilis, etc, drug or substance exposure–gold, mercury, penicillamine, trimethadione, skin-lightening creams Treatment Glucocorticoids and/or immunsuppressants may be used in some Pts. See Glomerulonephritis. Glomerulonephritis characterized by diffuse thickening of glomerular capillary basement membranes, due in part to subepithelial deposits of immunoglobulins separated by spikes of basement membrane material, and clinically by an insidious onset of the nephrotic syndrome and failure or disappearance of proteinuria; the disease is most commonly idiopathic but may be secondary to malignant tumors, drugs, infections, or systemic lupus erythematosus. pertaining to or emanating from a membrane. see alveolar epithelial cells (type 1). Membranous glomerulonephritis (MGN) has been defined as granular subepithelial deposition of immune complexes along the glomerular basement membrane (GBM) (Tateno et al. She had been previously diagnosed with end-stage renal failure secondary to systemic lupus erythematosus with membranous glomerulonephritis, and she was receiving long-term immunosuppression therapy. 9) Our patient had been receiving long-term immunosuppression therapy for systemic lupus erythematosus with membranous glomerulonephritis and chronic renal impairment. Membranous glomerulonephritis associated with renal cell carcinoma: failure to detect a nephritogenic tumor antigen. 3%), membranous glomerulonephritis (10%), chronic glomerulonephritis (9. Membranous glomerulonephritis associated with ensinophilic lymphfolliculosis of the skin (Kimura's disease): Report of a case and review of the literature. 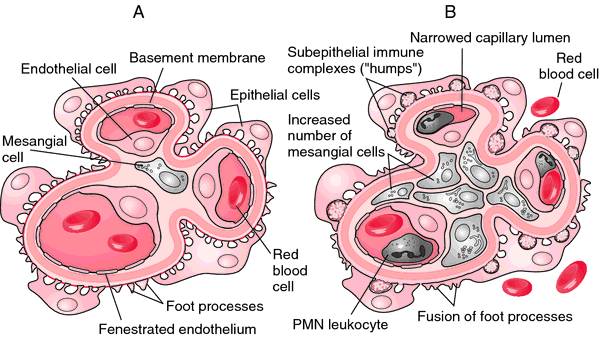 Membranous glomerulonephritis has been produced experimentally by the injection of homologous renal tubular epithelial antigen and tubular epithelial antigen has been demonstrated deposited on the glomeruli in membranous glomerulonephritis.